Decrypting the hundreds of variations of a skateboard you can throw your money at can be quite a feat. Last time we tried to explain different deck shapes, while this time we get into their features. In a nutshell: they should fit the kind of ride you are looking for. To get a better understanding before you walk into the next skateshop, we will clarify cutouts, flex, wheelbase, wheel wells, wheel flares and kicktails, and tell you what effects they will have on your Mellow setup. The essential thing is to keep your wheels rolling while keeping your board low to the ground. The wheels also need to be as close as possible to your board without touching as you lean into your turns. You can use risers (hard rubber or plastic plates) to raise the board to avoid wheelbite (when a rolling wheel touches the deck in a turn, causing the board to slow or stop suddenly, often ejecting the rider). There are three other ways to make room for bigger wheels: cutouts, wheel flares or wheel wells. The wood is removed around the wheel at each of the four corners of the deck, allowing your trucks to dive in deep without the wheel catching on the deck. For a Mellow, having cut-outs mean that you can run your trucks fairly loose, something that just isn't possible most full-shape decks without risers. The downside is that you have less board to stand on. When the area around the wheel is sanded in from the underside of the board. It increases the room for a mean lean, although not as much as with cutouts. If you like trucks that are loose, you may still require risers. The surface of the deck is actually bent in a rising wave to give room just as wheel wells do. This limits your stance on the deck since the board around the wheel now has a ripple like a potato chip, although some riders like the feeling of having their feet "locked-in". Wheelbase is the distance between the two trucks, usually measured from the inner pair of screw holes. The shorter the space, the more party: the ride will be playful and agile, but harder to control at higher speeds. 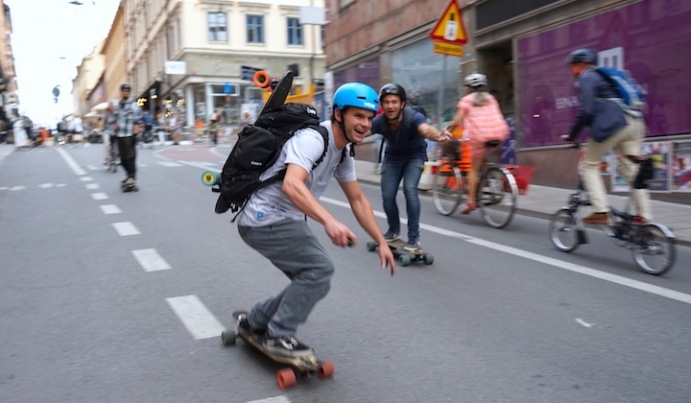 Longer boards can feel like a living room couch with enough room for a friend, especially when compared to the short wheelbase on short boards or cruisers. This will guarantee you a more stable ride and wider surfier turns, while making it harder to weave through sidewalks packed with pedestrians. This is when the deck is bent upward behind the rear truck, letting more experienced riders get up and down curbs by being able to pop the deck up easily. Having your back foot behind the back truck makes things pretty unstable at higher speeds, especially when accelerating. As a general rule of thumb, keep your rear foot on or forward of rear truck screws unless you are trying to win the local wheelie battle. Flex: Flexible decks act like shock absorbers, evening out all the cracks and the grittiness on the road, while keeping your feet from cramping up on longer rides. If they're too soft, you'll hit the ground with the Drive and find it hard to break into a drift. Just make a little clearance bounce test on your deck before you buy it to know that you won't be dragging your shiny new Mellow Drive on the pavement if the board dips. Let the endless learning continue by subscribing to the Mellow Times.